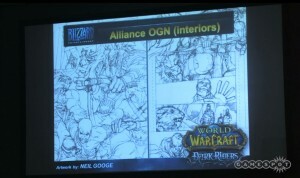 During the SDCC 2011 World of Warcraft, StarCraft and Diablo Swag Show panel, DC Comics Hank Kanalz revealed details of their Blizzard licensed graphic novels. 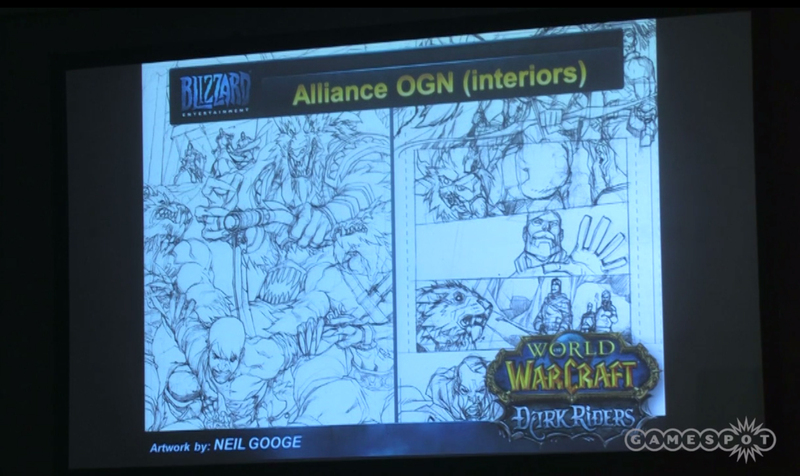 There will be two World of Warcraft graphic novels telling the stories of a Alliance team and a Horde team. These won’t be your usual mega heroes like Varian or Thrall. Each team is composed of characters like any other player, more down to earth. Teams that come unwillingly together to handle specific threats. The characters are the same shown in World of Warcraft Special # 1 (Dec 2009) who were going to star in the now cancelled ongoing comic book series … World of Warcraft: Alliance # 26 and the World of Warcraft: Horde # 1. As everyone knows, the ongoing comic books were cancelled, and shortly after Wildstorm was shutdown after 18 years in the business (read Jim Lee’s Farewell). DC Comics inherited the rights to develop the World of Warcraft and StarCraft Graphic Novels. 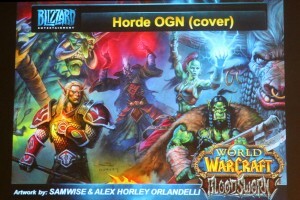 During the SDCC 2011 panel, DC Comics Hank Kanalz unveiled three OMG-Awesome-sauce covers of the World of Warcraft: Dark Riders, World of Warcraft: Bloodsworn and StarCraft Graphic Novels. 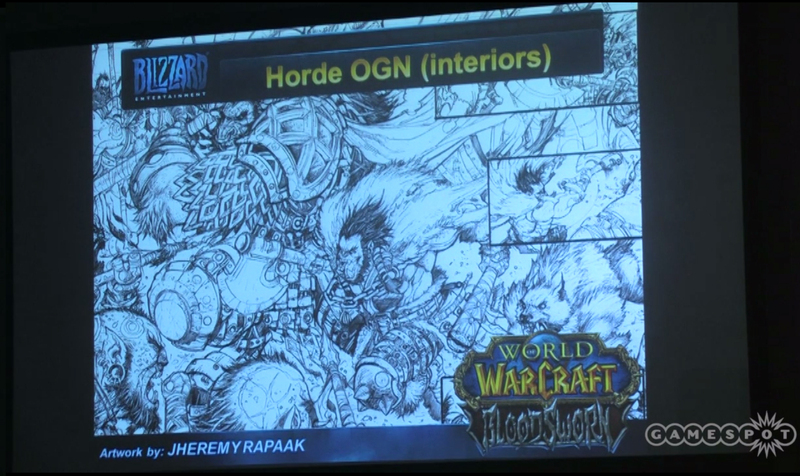 I think we have never seen artwork like this before in DC Comics Warcraft and StarCraft comic books. They look WoW TCG / Blizzard top-notch quality. 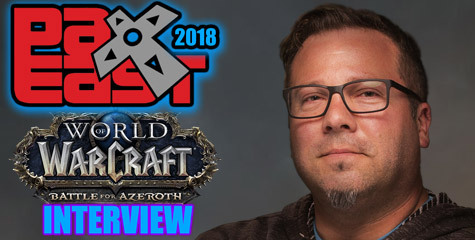 Hank Kanalz revealed at SDCC 2011 the World of Warcraft: Bloodsworn graphic novel is written by Doug Wagner with artwork by Samwise Didier, Jheremy Rapaak and Alex Horley Orlandelli. The Horde characters are: Malgar (orc hunter), Shagara (female orc shaman), Ironhoof (tauren warrior), Felgrim (undead warlock) and Ashra (blood elf paladin). This Horde militia team is put together to address a new threat to the Horde from a new power behind the Centaur. 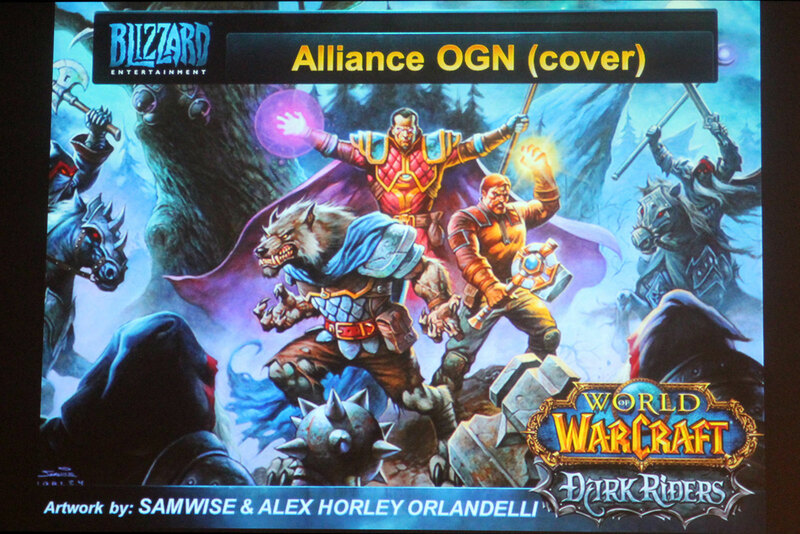 The World of Warcraft: Dark Riders Graphic Novel shows four characters on the front cover. 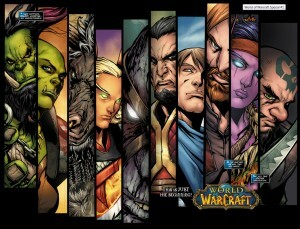 These fit the class and race profile shown in World of Warcraft Special # 1 for the characters that were to debut in the cancelled ongoing series: World of Warcraft: Alliance # 26. 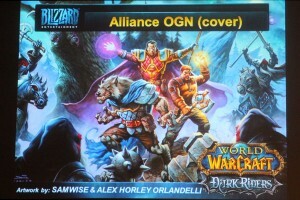 These characters in the front cover of the World of Warcraft: Dark Riders graphic novel are: Brink (gnome rogue), Karlain (human mage), Mardigan (Worgen warrior), and Revil (human priest). Loreli Fallglade (female night elf) is missing in the front cover, but she was shown in the 2009 Special # 1. 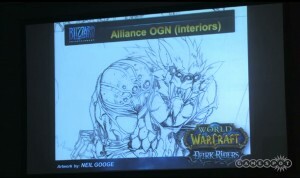 World of Warcraft: Dark Riders is written by Mike Costa, with artwork by Samwise Didier, Neil Googe, and Alex Horley Orlandelli. The Alliance story delves into the history of the Worgen, the Scythe of Elune, and the Dark Riders. After reading through this graphic novel fans will learn where the Dark Riders came from. The StarCraft Graphic Novel (Untitled yet) will debut in 2012 by writer Simon Furman and artwork by Wei Wang. 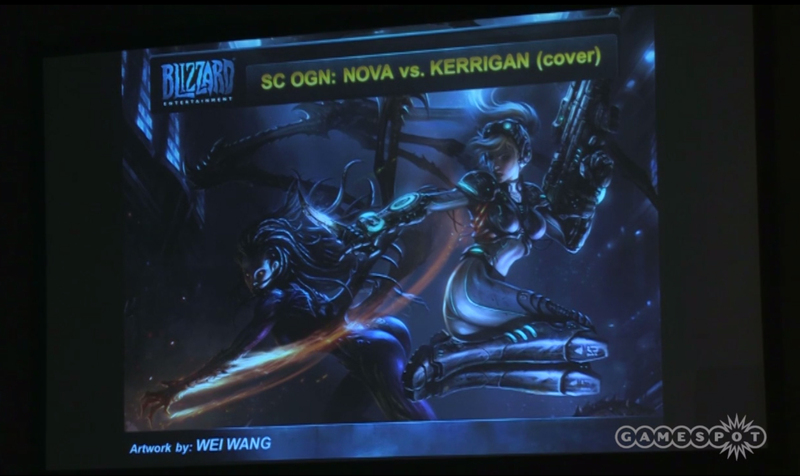 It is a 120-pages hardcover graphic novel featuring Kerrigan vs Nova. 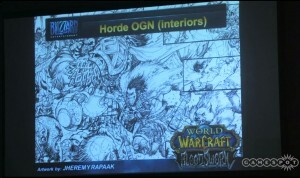 Hank Kanalz: Hank Kanalz: 25:34 – We are moving to do exclusive graphic novels for the World of Warcraft property. We got a couple in the workshift, the first one is a World of Warcraft Alliance graphic novel. It is written by Mike Costa and illustrated by Neil Googe. Mike Costa is better known for his work in The Transformers and G.I. Joe). Terrific writer, but also extremely into the Warcraft mythos here. Micky Neilson: 26:35 – “How many people actually played the Scythe of Elune questline? This features the Scythe of Elune. It features Worgen. Some of you who played that questline must remember the Dark Riders. You never actually got to see the Dark Riders in the game. So this is a really cool opportunity to see them, to get into their history, where they came from. 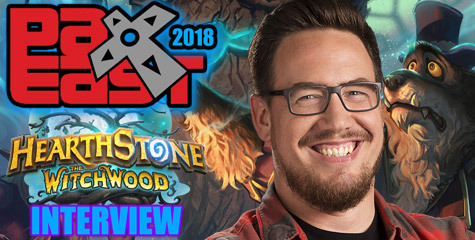 Hank Kanalz: 27:18 – “It’s been terrific too, because working with these guys very directly we are able to live a lot of the storylines together, a lot of the stuff you see in-game, or couple bits and pieces in Christie’s novels and the other novels all relate to each other. So you would be very pleased with how this is tied into everything else. 27:38 – Art by the fantastic Neil Googe. He’s terrific. He is been in Thailand for several months now, but he’s moved back to UK and he’s on homestretch finishing up the OGN. It should be up in the fourth quarter of this year. 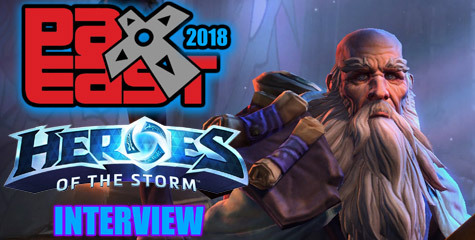 Hank Kanalz: Expect the Horde OGN in the fourth quarter of this year. 31:28 – Next we have the StarCraft graphic novel. It’s a 120-pages hardcover that’s coming on 2012. It’s written by Simon Furman who is probably best known for his The Transformers work, past and present. 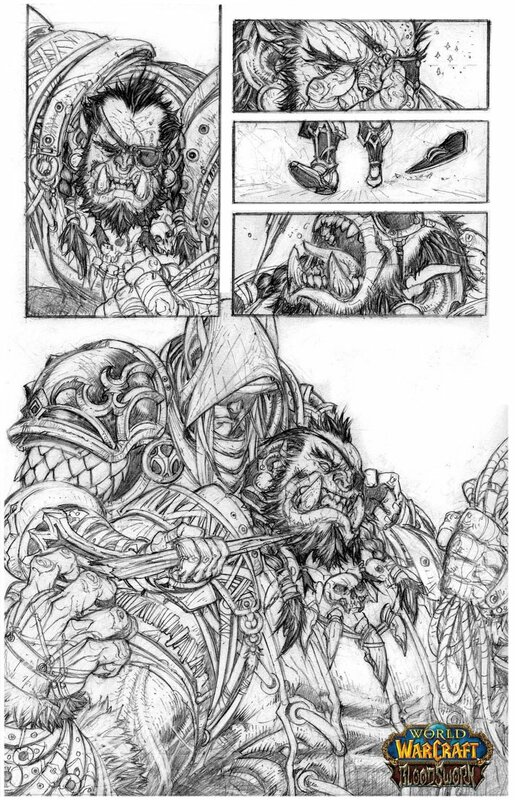 He also worked in the ongoing StarCraft comic book that we used to ship in a monthly basis. This one is an epic battle between Nova and Sarah Kerrigan. We were talking about the novel earlier there. 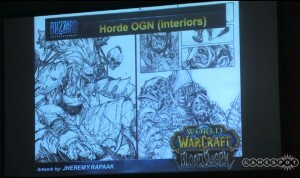 UPDATE: Jheremy Rapaak posted two hi-res images of his artwork from the World of Warcraft: Bloodsworn graphic novel — the same shown during the SDCC 2011 panel.